The Munich Agreement (Münchner Abkommen) concluded at Munich, September 29, 1938, between Germany (Adolf Hitler), Great Britain (Neville Chamberlain), France (Edouard Daladier) and Italy (Benito Mussolini) has become one of the most controversial international treaties signed in the twentieth century. It raised endless debates and controversies among, in particular, international legal scholars on whether the Agreement has been validly concluded under international law. The main purpose of the Agreement was to cede parts of the Czechoslovak territory (commonly known as the Sudetenland - area along borders of Czechoslovakia, mainly inhabited by ethnic Germans) to Germany. In fact, the conclusion of the Agreement opened the door to the annexation of western Czechoslovakia by Hitler’s forces. The major European powers, in line with the policy of “Appeasement”, only informed the Czech Government that it could either oppose Germany on its own or submit to the prescribed annexation of its territory. As it is commonly known, the Czechoslovak Government opted for the second option. The Chamberlain’s policy of “Appeasement” was subsequently discredited, when Hitler occupied the rest of Czechoslovakia in March 1939 and invaded Poland in September 1939. One of the most controversial features of the Agreement was the fact that it was signed without the presence of Czechoslovak political representatives. 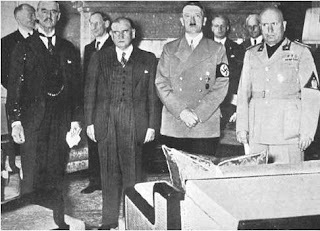 The powers assembled at Munich in September 1938 tried to avoid was at any cost and this is why the document has been commonly described as the Munich Dictate. At the time of its conclusion, the Signatories were bound by several obligations deriving from either customary-based or treaty-based international law. Firstly to be mentioned is the customary obligation not to engage in military intervention. Treaty based international law also subjected the states to several obligations, in particular, to the obligation not to seek the settlement of disputes except by peaceful means (Briand-Kellogg Pact of 1929). Moreover, under the First Hague Convention of 1899 all parties concerned had a duty to use their best efforts to ensure pacific settlement of international differences and to have recourse as far as consequences allow to the good offices or mediation of one or more friendly Power. In addition, the League of Nations Covenant also demanded its Signatories (except for Germany) to ‘respect and preserve against external aggression the territorial integrity and existing political independence of all members of the League’ (Art.10) and not to resort to war until the peaceful procedures of the Covenant had been exhausted (Art. 12). Recalling the above-mentioned, it seems manifest that by signing Munich Agreement France and Great Britain breached the Covenant’s obligation to respect territorial integrity of Czechoslovakia against external aggression. They had given Hitler green light to the annexation of the western Czechoslovakia. Undoubtedly, the solution prescribed by the Munich Agreement was not a peaceful one. The Signatories of the Covenant agreed they would not enter into any engagements inconsistent with the terms thereof. It may be argued that by signing the Munich Agreement they were in breach of the Covenant. Moreover, Article 20 of the Covenant abrogates all obligations or understandings which are inconsistent with the terms thereof thus rendering the Munich Agreement invalid. On a more general level, it must be said the Munich Agreement was in breach of the well established principle of sovereign equality of states. It aimed at cession of a territory whose territorial sovereign was not a signatory thereof. Its purpose was directly aimed at violating territorial integrity and political independence of Czechoslovakia. The doctrine of international law regards all agreements, which contravene general principles of international law, as null and void, in particular those agreements that aim at causing injustice. One of the major arguments speaking for nullity of the Agreement is the fact that it was imposed upon the Czechoslovak Government under duress reinforced by the threat of force. There was no freely given consent of the Czechoslovakian Government to be bound by the provisions of the Munich Agreement. Given the political situation, the Government had no other option but to accept it. Nullity of the Agreement may also be inferred from that its imposition or consent with was in manifest breach of Czechoslovak constitutional law which required previous Parliamentary approval. Of its four signatories, Great Britain, France and Italy declared the Munich Agreement as void already during the Second World War. Firstly, it was the British Government which announced on August 5, 1942 that ‘the final settlement of Czechoslovak frontiers would not be influenced by any changes effected `in and since’ 1938’ thus repudiating the Munich Agreement. Subsequently, General de Gaulle’s Government in exile declared (in September 1942) the nullity of Munich Agreement ab initio. Similarly, the new Italian Government (in September 1944) dissociated itself from the Munich Agreement. Finally, in 1973 the Treaty of Prague between Czechoslovakia and the Federal Republic of Germany declared the Munich Agreement to be null and void. The Signatories also agreed that their borders were inviolable and that they would not use force against one another.